1. Wu Y, Pan Y, Du L, Wang J, Gu Q, Gao Z, Li J, Leng X, Qin J, Wu X, Jiang Y, Identification of novel EIF2B mutations in Chinese patients with vanishing white matter disease. Journal of human genetics 2009 Feb 54 (2): 74-7. EIF2B4 Antibody (Center K161) (Cat. #AP51392PU-N)immunohistochemistry analysis in formalin fixed and paraffin embedded human skeletal muscle followed by peroxidase conjugation of the secondary antibody and DAB staining.This data demonstrates the use of EIF2B4 Antibody (Center K161) for immunohistochemistry. Clinical relevance has not been evaluated. 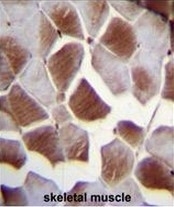 EIF2B4 Antibody (Center K161) (Cat. #AP51392PU-N) western blot analysis in mouse NIH-3T3 cell line lysates (35uµg/lane).This demonstrates the EIF2B4 antibody detected the EIF2B4 protein (arrow). EIF2B4 Antibody (Center K161) (Cat. #AP51392PU-N) western blot analysis in K562 cell line lysates (35µg/lane).This demonstrates the EIF2B4 antibody detected the EIF2B4 protein (arrow). 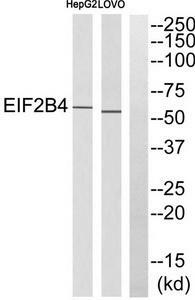 Western blot analysis of EIF2B4 expression in A431 (A); mouse brain (B) whole cell lysates. (0.3ug/ml) staining of K562 lysate (35ug protein in RIPA buffer). Primary incubation was 1 hour. Detected by chemiluminescence. Western blot analysis of extracts from HepG2 cells and LOVO cells, using EIF2B4 antibody.The lane on the right is treated with the synthesized peptide.